CRUSH CURATORIAL is pleased to present Spitting Image, Eva O’Leary’s New York solo debut exhibition which opens April 6th, 6-8 pm and runs through May 13th, 2017. The women in Spitting Image are not vain or pitiable, nor are they comfortable in their own skin. 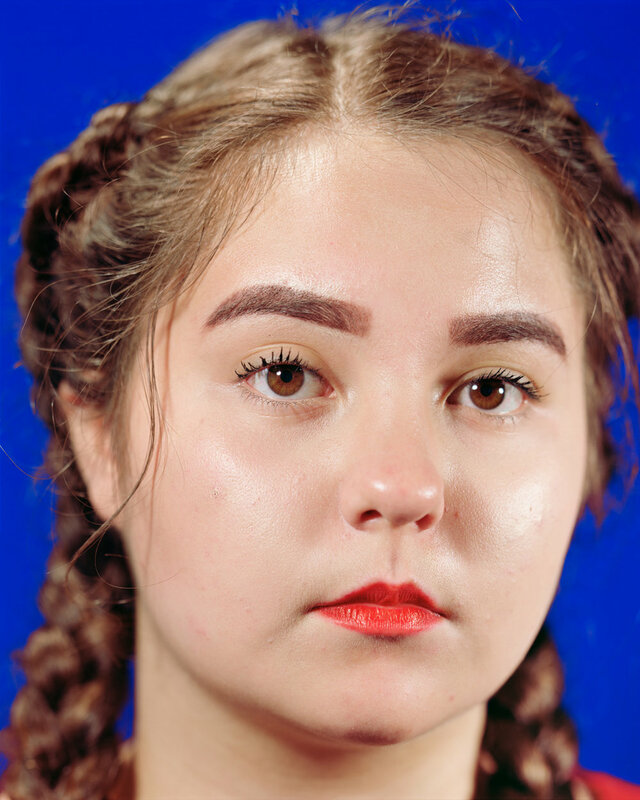 They are young women who—like most women in this country—have been inundated by imagery that projects the fantasies of others onto their bodies, teaching them to suppress their desires, values, personality, and flaws. Spitting Image presents a group of photographs and videos that examines the relationship between gender, image, commerce, and identity through found and re-performed beauty rituals. 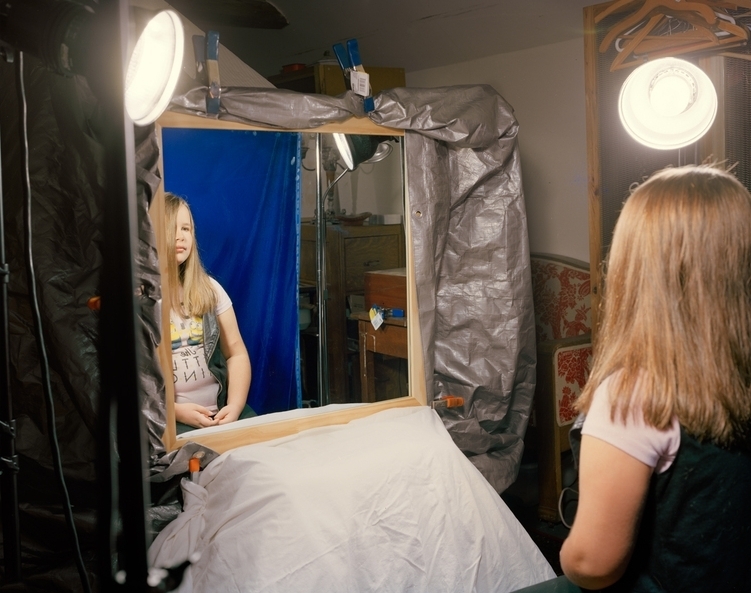 At the center of the exhibition is a video and a group of portraits that depict adolescent girls reacting to their own image through a two-way mirror. 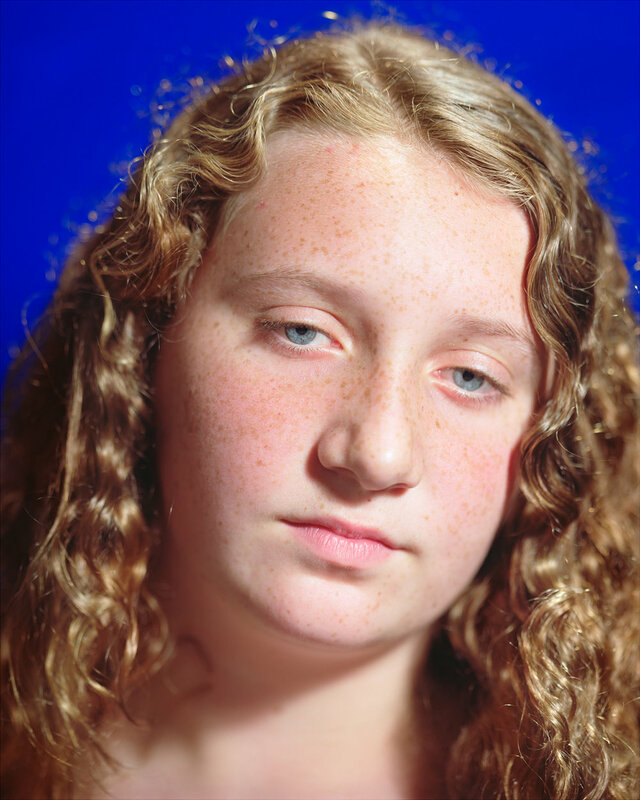 The still images pair the girls’ unsettling vulnerability with the blank backdrop of a yearbook photo and the glowing light and clarity of a glamor shot. 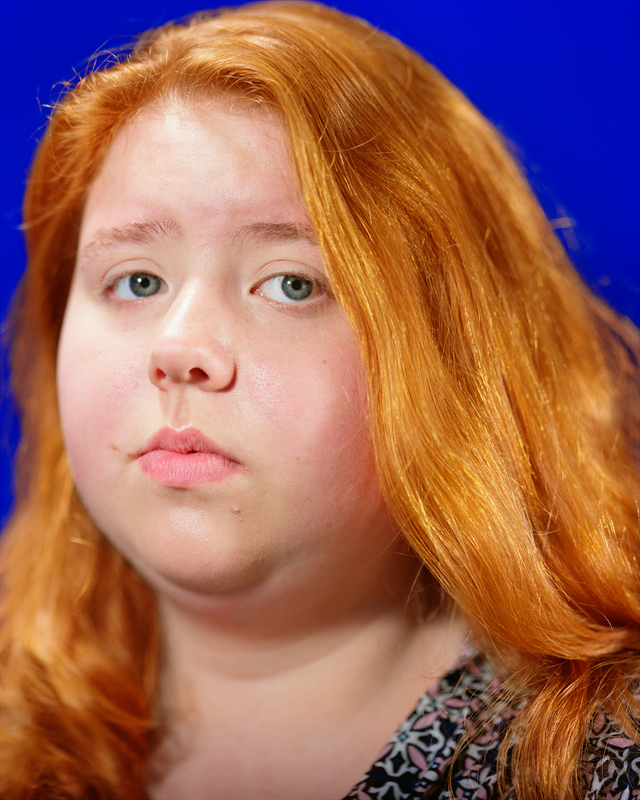 The video, which shows the girls in the act of posing, reveals the dueling anxiety and confidence of young women learning to manage the endless and intricate modulation of their own image. In another video—one that can be seen as the inverse of the first—O’Leary strings together a sequence of selfies (found online) in which an accidental camera flash obscures the subject’s face in the mirror and relegates glimpses of bodies to the periphery of the frame. While the video of adolescent girls posing uses mirrors to reveal the particularity of character apparent in even the most self-conscious acts, the video of the found mirror selfies focuses our attention on the erosion of individuality in the age of social media. The tension implied between the two videos—that the mirror is simultaneously a site of claiming and losing individuality and power—is the definitive tension of this body of work. O’Leary’s images and videos can be as slick and sweet as a glossy magazine, but it’s the clarity of their details—the texture of face paint settling over pores, stray hairs and furrowed brows, or a girl un-rumpling her shirt—that unmasks the bilious unreality at the heart of commercial imagery of women. And, while the toxicity of commercial imagery is one of its central concerns, Spitting Image is not a simplistic takedown. Watching O’Leary’s subjects watch themselves emphasizes the impossibility of separating out which acts of self presentation are resistance to beauty norms and which are capitulations. Spitting Image is a nuanced portrait of the psychological space in which women must balance their own identities, insecurities, and desires with the ever-present reality of imagery that is insistently, but seductively, unreal. Eva O’Leary (b.1989) was named a Foam Talent in 2014, and has exhibited in solo and group exhibitions within the United States and abroad, including at the Serpentine Gallery (London), l'Atelier Néerlandais (Paris), and Danziger Gallery (New York). Her work has appeared in various publications, including The New York Times ‘T’, WIRED Magazine, and The Huffington Post. She received a BFA from California College of the Arts in 2012, and an MFA from Yale in 2016. In 2017 she was the recipient of the Vontobel Contemporary Photography Prize. She currently lives and works between New York and Pennsylvania.